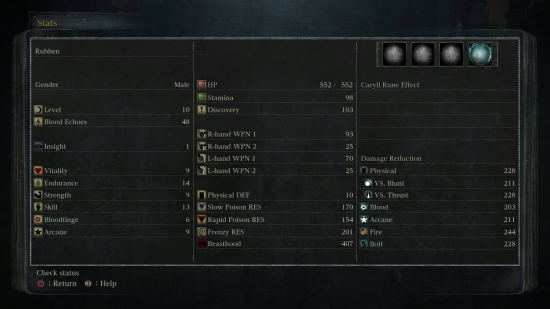 This tutorial will use as base the Bloodborne statistics to teach you how to create a leveling system such as that (and with this, modify to create your own). The possibilities provided by this are enormous! Feel free to modify to suit your game. This tutorial assumes you will have a one character party in a single player game. And by the right there is Damage Reduction, as said. Considering this, what will you create in the Statistics of your game in 001? If you answered the left portion of the image, you are definately wrong! Simple: when you equip a weapon, what does it increases? Your strength or your right hand wapon attack? So basically, yeah, all the other stats (middle and right section) will need to be created as statistics in your game. Now that you know what are the differences, here is the first step: create statistics! Why Arcane Attack? Because it's easier to take in consideration upon calculating it later on the Damage Script. So you can make "enchanted weapons" and stuff. Neat, right? Step two: create actor variables! Level (LVL) - we are not using 001's default leveling system, are we? Leave Bloodtinge out. It is not a copy of Bloodborne after all. Now that we have statistics and variables, we need to set default values. First, go to your main actor and change the maximum level to 1. Experience won't matter. Now, set the statistics to the default value you want the player to start with. Then, get to your actor variables, and do the same: set default values. Guess what you are going to do? Increase the actor variable received in Statistic by Amount. Then all you need to do is a Multi-Comparison Branch for each statistic, and so change their values using Change statistic. Easy? Super. And, of course, increase the variable LVL with the Amount given too. That is how they roll. For the last part, change the damage script. Whichever you want, the old Weapon Damage or the actor Attacked (I actually don't know the difference). Add your custom calculations to consider all the new attacks and defenses, and there it is. Bloodborne leveling system. Also, you can use custom made experience/money just like they do, create a "level shop" to spend them, and well, get criative! There's been a total of 3095 views(s). There's been 1956 people that have viewed.